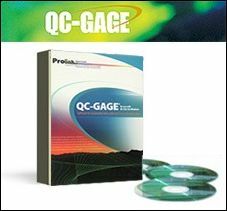 Prolink's QC-Gage™ is a full-featured data collection program for use with hand-held gages. Using QC-Gage, quality control managers can create specific measurement requirements for inspection. Inspectors can then use this information as a guideline during inspections. During the inspection process, the inspector can enter measurement data by keyboard or through a direct connection to one or more gages. QC-Gage displays this data both graphically and in table form. In addition, it can automatically interface with Prolink's industry leading QC-CALC™ Statistical Process Control software for data charting, analysis, and manipulation.